When the source data for your data-driven charts is available in Excel, you can create charts directly from the Excel application. When data in Excel changes, you can either update the charts on command or have think-cell do the update automatically. The layout of your data must match the layout of think-cell’s internal datasheet: Column charts are usually created from data columns, whereas bar charts are created from data rows. Nevertheless it is possible to transpose the data source (see Transposing linked data). In addition to the data, some cells to the left and on top are reserved for category and series labels. If you are unsure about the exact layout required, simply insert a new chart of the desired type in PowerPoint and refer to the layout of its datasheet. When you click on this menu item in Excel, the PowerPoint window is activated. If PowerPoint is not yet running, it starts automatically. In PowerPoint, when the mouse pointer is on a slide, the familiar insertion rectangle appears. Switch to the slide where you want to insert the chart, or insert a new slide, and place the chart as usual: Click once to accept the default size or click, hold and drag to change the chart’s initial size. For a detailed description on how to place, resize and align a new chart, please refer to Inserting a new chart. Please refer to Adding and removing labels and Styling the chart to learn how to configure and style the chart. 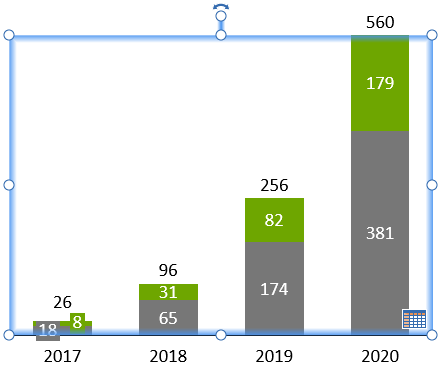 Note: If you use colored cell backgrounds in Excel, you can set those as the segment fill color in the linked chart by enabling Use Excel Fill on Top in the chart’s color scheme control (see Color scheme). This can be especially powerful when you combine it with Excel’s conditional formatting. As well as creating a new chart, you can link a selected data range in your Excel workbook to an existing chart in a PowerPoint presentation. Simply click the To Existing Chart button from the Charts menu in Excel’s think-cell toolbar and click on the chart in PowerPoint that you wish to link to. Having linked a data range to a chart, you can alter how the data is interpreted using the Transpose Link button in the think-cell context menu of the data range. Transposing a data range swaps the chart’s row and column data interpretation, letting you, for example, create column charts from rows rather than columns of data. Select the green boundary around the data range. 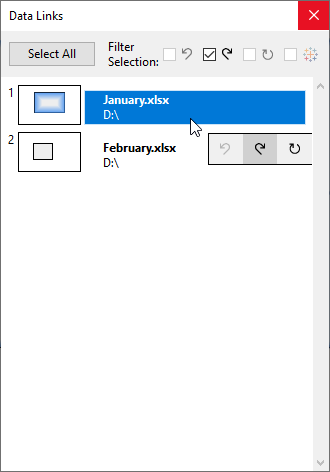 Right-click on the boundary to invoke the context menu. Select the button Transpose Link. Note: Transposing a linked data range does not swap the data in the rows and columns. After pressing Update, this button changes to Revert. Click it to take back the changes you just made. The Revert button is available until the PowerPoint file is closed or the Excel data source changes again. In the later case, it is replaced by the Update button. Even if the chart is not updated, or is updated and then reverted again, the link to the Excel data source remains. Thus, you always have the option to update the chart later. You can also let think-cell automatically update the linked chart for you. This option is available in the Data Links dialog (Data Links dialog). Note: Linking a chart to data in Excel using think-cell does not depend on the file names of the Excel or PowerPoint file. Each chart as well as each data range in Excel is assigned a unique identification number that is used to maintain the link. 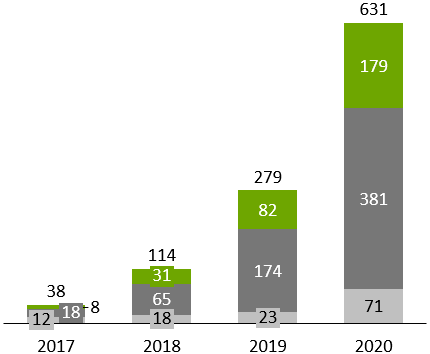 The technical requirement for reestablishing a link is that both the Excel file containing the data range and the PowerPoint file containing the chart are simultaneously open on the same computer, irrespective of the file names. For all slides in the current presentation, the data links dialog shows a visual representation of linked charts on the respective slides. In a second column is a list of the Excel files that contain the linked data. Each file is shown next to the first slide with a chart linked to that file. The Excel file that contains the linked data is highlighted in the right column. You see the file name and the location below that. A tooltip shows the last modification of the linked data. The chart is marked by when an update is pending. The linked Excel file must be open for this indication to be available. Update to incorporate data changes from Excel in the PowerPoint chart. Revert the last update from the linked data and return to the chart’s previous state. You can also revert to undo the latest automatic update. Switch to Automatic Update to let think-cell automatically update the chart whenever changes in the linked data are detected. The chart is not highlighted or marked, but you still have the option to manually revert the automatic update. Change detection works only while both files, Excel and PowerPoint, are open at the same time. Click a single chart to select it. PowerPoint will also switch to the chart (in Normal view) or the slide (in Slide Sorter view). 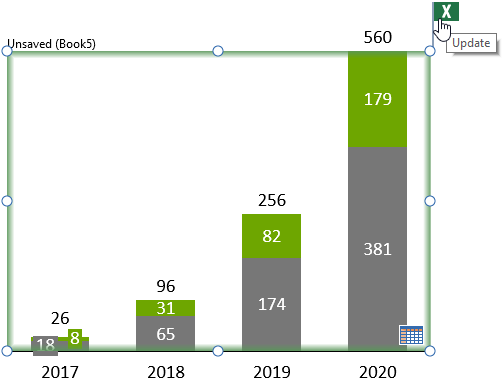 Double-click a chart to create the same effect as a double-click on the chart itself: The linked Excel workbook is opened and the linked data is selected. If the data source is not available, the internal datasheet is opened instead. Click a file in the right column to select all charts linked to that file. Ctrl-click to select multiple charts individually. You can also Ctrl-click files to add all charts linked to that file to the selection. Ctrl-click multiple slides to select all charts on the selected slides. Use Shift to select a range of slides and all charts on them or a range of files and all charts linked to them. Use Ctrl+A to select all linked charts. For all selected charts you can then Update, Revert or Switch to Automatic Updates. Note: If the linked Excel file for a chart is not available, and the internal datasheet is opened and edited, then automatic updating for the linked chart will be disabled. This ensures that any changes made using the internal datasheet are not automatically overwritten when the linked Excel file becomes available. You can pass on or edit the files independently. You can rename the files. The data links will be reestablished as soon as the Excel and PowerPoint files are open at the same time. To store the information about the reestablished data links the files should be saved. You can copy and paste linked charts within the same presentation or even to another presentation. The copy of the chart will then be linked to the same data source as the original. You can send the Excel and PowerPoint files by e-mail. The data links will be reestablished as soon as the Excel and PowerPoint files are open at the same time on the computer of the receiver. To store the information about the reestablished data links the files should be saved. You can make copies of linked Excel files and use the copies as alternative data sources for the data links. The original and copied Excel files can be independently edited. The link between a PowerPoint presentation and the desired Excel file will be established when opening one of either the original or the copied Excel files together with the PowerPoint file. Note: When copies of the same linked range in Excel are present in open workbooks, e.g., after copying a worksheet, both copies are equally valid source ranges ("siblings") and it is undefined with which range the link will be established when opening the PowerPoint file. 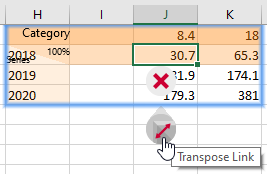 A warning is displayed next to affected linked ranges in Excel in this case and you can use the little blue buttons displayed below the think-cell frame in Excel to switch between all siblings. You should then make all but one copy of the linked range unavailable, e.g., by closing the respective workbook. Alternatively, you can make all the linked ranges unique by deleting all but one of the think-cell frames in Excel and linking each range to the desired chart, respectively. This way, each new frame is assigned a unique identifier. If you edit the PowerPoint file without the linked Excel file(s) being available, linked charts simply behave as regular charts with an internal datasheet. Using think-cell, you can change the chart’s design and data without restriction. Similarly, you can freely edit an Excel workbook without the linked PowerPoint file(s) being available. With think-cell installed, any linked data ranges that are not currently connected to an open PowerPoint presentation, are highlighted with a light red frame. As soon as you open both the data source in Excel and the chart in PowerPoint at the same time, the link is reestablished. In Excel, the highlight of the linked data range changes from red to green. In PowerPoint, the chart’s current data is compared to the data source. If changes are detected, the chart is highlighted in the data links dialog, and it is flagged when selected. You can now manually update the chart to the latest data from Excel. From that point on, the chart only uses the think-cell datasheet in PowerPoint. Similarly, you can disconnect a linked data range in Excel from its charts: Select the linked range by clicking on its frame. When the frame turns blue, indicating a think-cell selection, right-click on it and select the Delete button. The think-cell frame is removed while the data itself remains untouched. 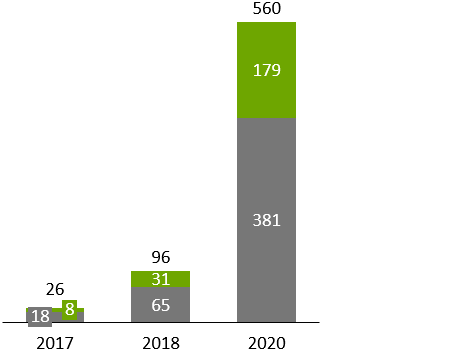 Any linked charts will no longer be able to connect to this data range as their data source, and will instead use their internal datasheets. Note: You cannot undo the removal of a linked frame, but you can create a new link with an existing chart, when you need it (see below). Whenever you remove one participant of a link, either the data range in Excel or the chart in PowerPoint, the other side does not get deleted with it. Charts in PowerPoint fall back to using their internal datasheets, and linked data ranges in Excel simply remain in place until they are explicitly removed. This is important because there may be other charts in other presentations linking to the same data source. If you want to link an existing chart to an Excel data source, first go to the Excel workbook and select the desired data range. You can also select an existing linked range, indicated by the colored think-cell selection frame. Then switch to PowerPoint and select the desired chart. If the chart is already linked to some other data source, disconnect it as described above. Now the Excel link button in the chart’s context menu has changed to Establish Excel Link. Click this button to establish a link from the selected chart in PowerPoint to the selected data range in Excel. Note: If you want to remove all data links from a presentation, use the data links dialog (Data Links dialog). In the data links dialog, you can simply select all charts and press Delete to remove all links in a single action. Place the think-cell data link frame in an empty area on your Excel worksheet. Then use Excel’s cell references to populate the think-cell frame with data from elsewhere on the worksheet. E.g., enter =B5 in cell F8 to update F8 whenever B5 changes. Excel cell references also work across worksheets. Adding a dedicated worksheet as an interface sheet for all charts can be helpful in particular if you have many charts to link. Using a dedicated sheet as the source for your charts also helps to prepare the data specifically for the intended purpose. For example, you can use think-cell round to consistently round the data before presenting it in a chart (see Excel data rounding). You can simply hide entire rows or columns of data from being reflected in the chart by using Excel’s Hide command. Keep in mind that the hidden data will appear in the chart as soon as you use Excel’s Unhide command and update the chart. Similarly, you can use Excel’s Group and Outline function to hide data that you do not want to be shown in the chart. Select a cell range on an Excel worksheet where the extracted numbers will later be inserted. Click the Chart Data Capture button in think-cell’s ribbon group in Excel. Follow the procedure described in Extracting numerical data from images to position the capture window, check the highlighted detection result and click the Import button. The image’s numerical data is inserted into the previously selected cell range. You can use the data range as the source for a linked think-cell chart in PowerPoint or for further data analysis in Excel. 19.8.1 What are the advantages over Microsoft OLE? The charts are always the same, whether they are linked or not. Even linked charts are native MS Graph charts, not Excel charts pasted into PowerPoint. Charts can be linked to Excel at any time, not only when they are created. Linked charts remain editable, even when the linked data source is not available. Links in think-cell are independent of the file name or path. Simply open both files and any existing links between the files are reestablished. 19.8.2 What happens when copying a linked chart? You can copy a linked chart just like any other chart by duplicating a slide, duplicating the chart, Ctrl-dragging the chart or copy-pasting the chart to another slide or to another presentation. In fact, even making a copy of the presentation file is a way to copy a contained linked chart. In any case, the original and the copy are indistinguishable. Both link to the same Excel data range and, if they are open simultaneously, will both receive an update when Excel data changes. 19.8.3 What happens when a linked chart is deleted? When you delete a linked chart, the link in PowerPoint is removed together with the chart. 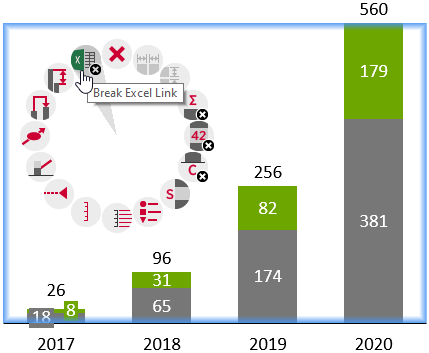 If there is no other chart in an open presentation linking to the same Excel data range, the frame in Excel turns from green to red, indicating that the link cannot be established. The linked data range in Excel is not affected in any other way by the deletion of a linked chart. After all, it is possible that a copy of the linked chart has been made, which, when opened, should reestablish its link. 19.8.4 How can I get rid of the red frames in my Excel worksheets? Different coloured frames in the Excel worksheets indicate linked data ranges. 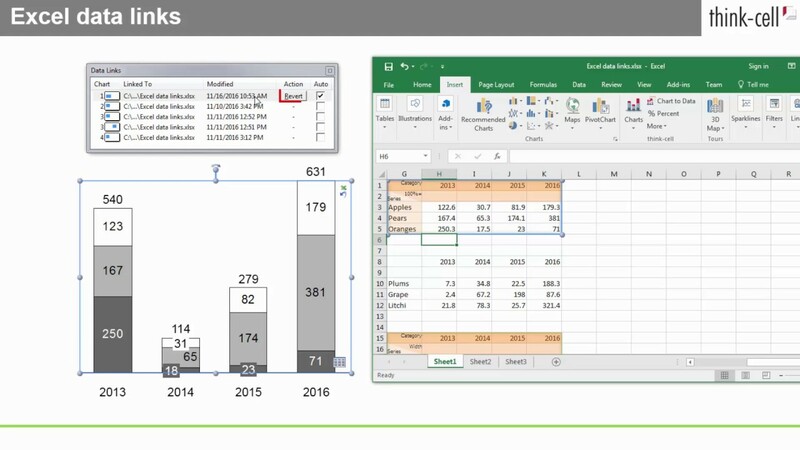 A green frame indicates that a link has been established between the framed data range and a chart in an open PowerPoint presentation. In contrast, a red frame indicates that no linked chart is currently open. A red frame does not necessarily mean that there are no charts at all linking to that data range. It just means that in the currently open presentations there are no such charts. If you are sure that the framed data range is no longer required as a data source for any charts, you can remove the frame with the Delete button from the context menu. Together with the frame, the link information is removed from the Excel workbook. Any charts that are linked to the concerned Excel data range will not be able to establish their links in the future. Instead, they will use their internal datasheets. The Excel data itself is not affected. 19.8.5 How can I see which charts in a presentation are linked, and where their linked data sources are? If you are unsure about the data sources of the charts in a presentation, go to the More menu and open the Data Links dialog. 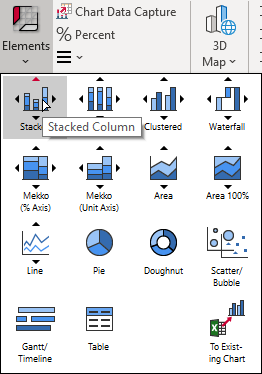 This dialog displays a list of all linked charts in the current presentation. Click on an entry to display the corresponding chart. The file name of the Excel file where the linked data range was last found is also available. The Auto checkbox indicates if the chart has been set to update automatically. For a detailed description refer to section Data Links dialog. 19.8.6 What happens to a linked chart when its data source is unavailable? When the Excel workbook that contains a chart’s linked data range is not open and cannot be found in the same file location where it used to be, the chart cannot establish its link. Instead, it will use its internal datasheet, which always contains a copy of the linked data, and allow you to change the chart. The internal datasheet of a linked chart is similar to the one of a regular chart. Even if there are multiple charts linked to the same Excel range, their internal datasheets are independent. If you want to reestablish the link to the Excel data range, simply open the Excel workbook and the presentation with the linked chart at the same time. The chart in PowerPoint and the data in Excel will then automatically connect. When updating the chart with the linked data, any changes you made to the data in the internal datasheet will be overwritten. 19.8.7 How can I use the internal datasheet instead of the linked Excel data source? To disconnect a chart from its linked data source, use the Break Excel Link button from the chart’s context menu. From now on, the chart only uses the think-cell datasheet in PowerPoint. You can remove the link from a chart, whether the linked Excel data range is currently open or not. For the Excel side of the data link, breaking the link of a chart has the same effect as removing the chart. For further information read section Changing and removing links. 19.8.8 How can I enable or disable Auto-updating? Go to the More menu and open the Data Links dialog. This dialog displays a list of all linked charts in the current presentation. The Auto checkbox determines if a chart is set to update automatically. When selecting a chart in the presentation, the corresponding entry in the Data Links dialog will be selected, and vice versa. 19.8.9 Why is my linked chart not updating although it is set to Auto-update? The PowerPoint side and the Excel side of a data link can only connect when both files are open at the same time. Therefore, when the data in Excel is changed while the PowerPoint presentation is not open, and then the presentation is opened without the Excel workbook being open at the same time, the linked charts will not detect the changes in their data sources. As soon as the Excel workbook containing the linked data range is open, the link will be established and the changes will be detected. If the chart is set to Auto-update, it will update now. Otherwise, the chart will be highlighted in the Data Links dialog, and it will be flagged when selected. You can then decide whether you want to incorporate the changed data into the chart or not. For more information read section Updating a linked chart. 19.8.10 Why is my linked chart indicating a pending update although the data in Excel did not change? Whenever a link is established between an open PowerPoint presentation and an open Excel workbook, the data from the internal datasheet is compared to the linked data range. If they are not the same, the chart is flagged to indicate that an update is due. If Auto-update is enabled, it is updated immediately. A pending update may also be detected when the data in the Excel workbook is unchanged, but the data in the internal datasheet has been modified. For a linked chart, the linked Excel data range takes priority over the internal datasheet. Therefore, an update will always overwrite any changes in the internal datasheet. To protect you against data loss, whenever you make changes in the internal datasheet of a linked chart, Auto-update is disabled for the concerned chart. 19.8.11 How can I link an existing chart to a data range in an Excel workbook? Go to the Excel workbook and select the desired range. Then switch to PowerPoint, select the desired chart, and click the Establish Excel Link button in the context menu. For a detailed description, refer to section Changing and removing links. To learn how to insert a chart directly from Excel, read section Creating a chart from Excel. 19.8.12 My linked chart seems to ignore part of the Excel data range. Why? In addition to the main data, the linked range in Excel contains some cells to the left and on top, which are reserved for category and series labels. If the selected range encloses only the main data, part of the data will be interpreted as labels and will not show up in the chart. If you are unsure about the required layout, simply insert a new chart of the desired type in PowerPoint and refer to the layout of its datasheet. For further information read section Creating a chart from Excel. 19.8.13 Why is Excel slow when I have lots of linked data ranges? Excel performance can be improved by disabling automatic error checking. To do this, select from Excel’s Tools menu Options, click on the Error Checking tab and uncheck the Enable background error checking box. For Excel 2007 and later go to the dialog Excel Options, select Formulas and uncheck the box Enable background error checking in the section Error Checking. 19.8.14 I have a lot of Excel files to visualize with think-cell. Can I run think-cell in batch mode? It is possible to program think-cell. think-cell offers a function to create presentations from templates (see Automation with Excel data).